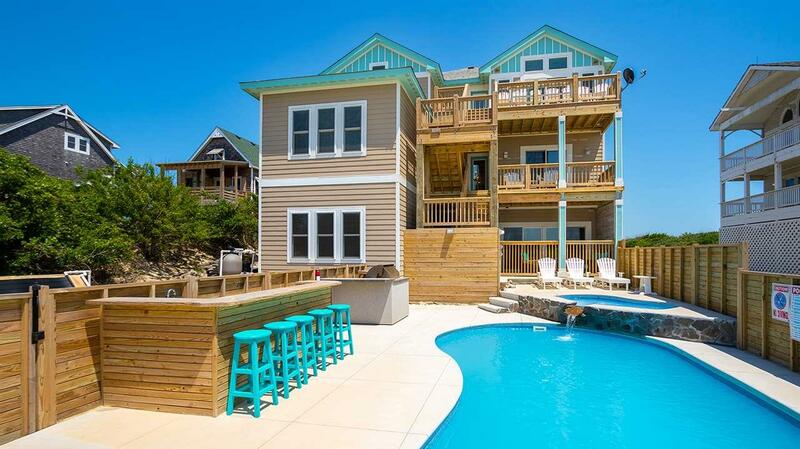 Newly constructed, custom built 10 bedroom oceanfront home! 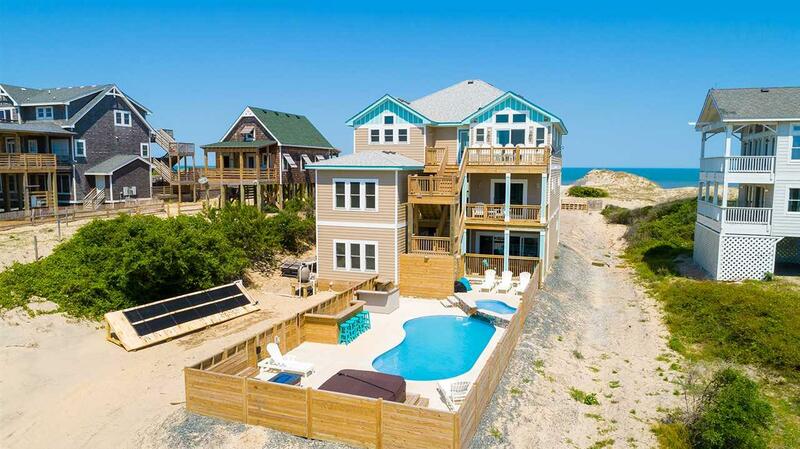 Situated on a large tract of land just 2.3 miles up the beach, this home epitomizes luxury oceanfront living. Close to town with a private driveway off the beach, youll find the seclusion of the 4X4 area with the ease of all the pavement amenities that Corolla has to offer. 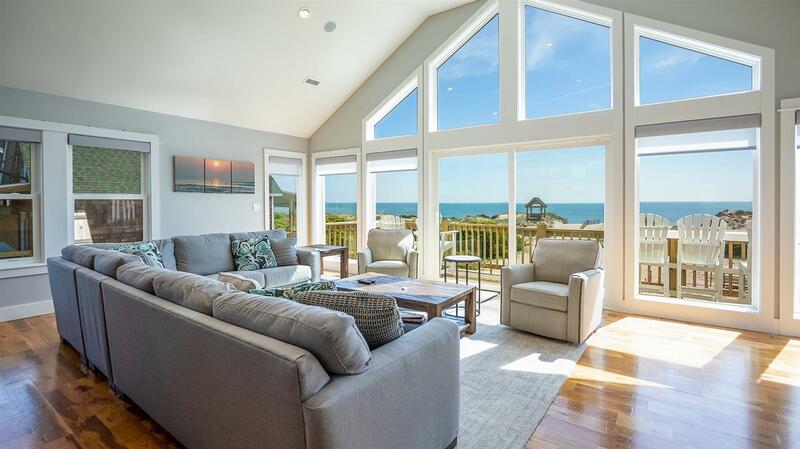 Take in the oceanfront views from the expansive decks or relax and enjoy the sunset on the sound side porch that overlooks the solar heated pool. Soak up the sun by the private pools tanning ledge while the kids enjoy time spent in the baby pool. The built-in fire pit and outdoor bar provide the perfect atmosphere to relax after a long day on the beach. The covered patio here offers its own shaded oasis which opens up seamlessly to the rec room equipped with a full bar, ice maker, stainless steel refrigerator, multiple TVs and a pool table. On this ground level you will also find a spacious 12 seat theatre room with surround sound, as well as, 2 master bedrooms and one handicap accessible bedroom and shared bath. As you make your way up the pallet wood lined stairwell to the second floor, youre welcomed with ocean to sound views in the spacious den with hardwood floors, an electric fireplace, bubble wall, two washers and dryers, and 5 master bedrooms with custom-tiled baths. On the third floor, you will be blown away by the wall-to-wall windows displaying the panoramic views of the ocean and sound. The open concept here is the perfect atmosphere for hosting large gatherings with family and friends. This homes custom kitchen is equipped with dual refrigerators and stoves, granite countertops, and an Alexa controlled range oven. The two master bedrooms on this floor both have direct deck access to enjoy the unforgettable sunrises and sunsets. Take in the ocean views and watch the wild horses graze from the master bedrooms private hot tub or unwind in the master bath that boasts heated tile floor, vessel sinks, and dual rain shower heads with body jets. This home features all the latest technology including; home automation with lighting features, a Sonos whole house audio system, and streaming video and satellite TV. 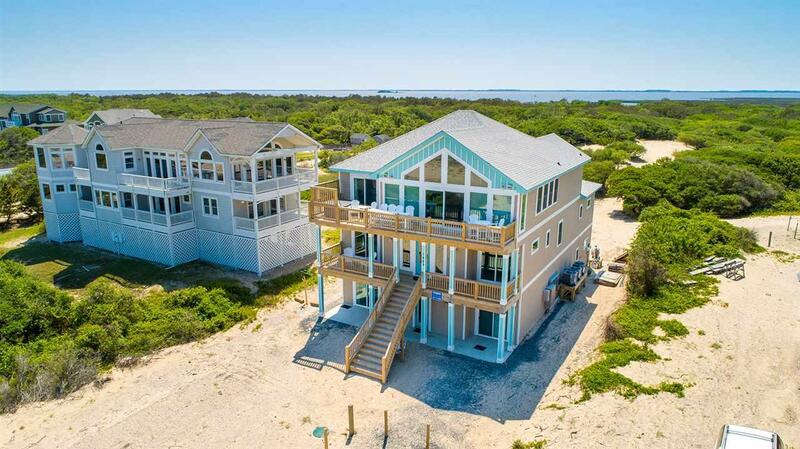 Dont miss your chance to see this Outer Banks rarity! Listing courtesy of Hunter Davis of Twiddy & Company - Corolla.